The story of the Burghers of Calais is one of those that "everyone knows" and no one bothers to examine critically. Reported first by Jean le Bel (c.1290 - c.1370) and most famously by Jean Froissart (c.1333 - c.1400; he lived a short time at the court of Edward and Philippa and spoke highly of them both), it tells of the result of a siege in Calais during the early stages of the Hundred Years War. Edward, right after the Battle of Crécy, laid siege to Calais. Philip VI of France could not help, and Calais had to capitulate to avoid starvation. Edward said he would refrain from punishing the city for holding out against him if six of their leaders would sacrifice themselves to him, appearing before him with nooses around their necks. The story gores that Edward was in his rights to hang them, and that no one could persuade him otherwise. No one, that is, until his wife, Queen Philippa of Hainault, spoke to him. She entreated him to mercy, and he relented and set the six burghers free. The legacy of this anecdote is that the six burghers (whose names are known; they were led by Eustache de Saint-Pierre) were strong and steadfast patriots, that Edward was within his rights to execute them, and that only his love and admiration for his wife's feelings turned his heart and inspired him to mercy. History loves seeing brave and defiant underdogs, however, and the reputation of these "common men" standing up to Edward is not likely to be changed in any history books. 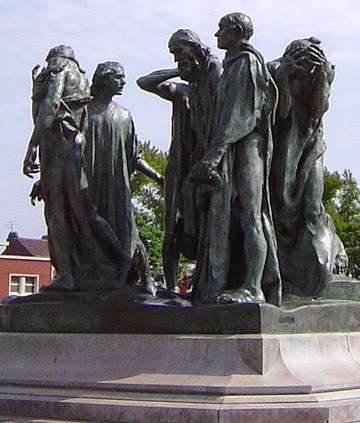 In Calais now you can find a famous statue of the Burghers of Calais by Auguste Rodin, created in 1899, the commemorates the incident. Philippa of Hainault has been mentioned as a minor part of the story of the Battle of Cassel, and as the person who introduced the herb rosemary to England. She was born on 24 June 1314, the daughter of Count William I of Hainault and Joan of Valois. When she was only 12 years old, she was promised in marriage to Edward, Duke of Guyenne. This was an important betrothal, because Edward would one day become King Edward III of England. The marriage took place in 1327—sort of—when Edward sent the Bishop of Coventry to marry her by proxy and cement the relationship. Edward became king on 1 February 1327, and the second ("actual") marriage was celebrated on 24 January 1328. She was not crowned a Queen right away, however. The country was still in the hands of Edward III's regents, his mother Queen Dowager Isabella and Roger Mortimer, the lover she had taken. Isabella was not keen to have another queen in England, so Philippa's coronation did not take place until March 1330 when she was already six months pregnant with Edward, the Black Prince. Philippa's gentle ways were much loved by the English citizenry; rather than bring a retinue of servants, she maintained only a few of her countrymen and embraced the English in the palace. She urged Edward to focus on England's commercial opportunities, especially the textile industry (which she knew something about because of Hainault's success in this area). She also fulfilled one of the main functions of a queen admirably: she bore Edward 14 children, nine of whom died before she did, including her eldest, Edward the Black Prince. The descendants of her children would ultimately contest the throne in generations to come, creating the 30-year period of hostility known as the Wars of the Roses. Philippa is especially known for an episode involving problems between Edward and the Burghers of Calais. I'll tell you about that tomorrow. Lower classes revolting against taxation and economic unfairness is as old as taxation itself. In 14th century France, a situation arose that brought most of the country into conflict, and involved a pope and England as well. In the 1320s, the Count of Flanders was collecting taxes for the King of France, Charles IV. Residents of several communes, including Cassel, gathered under the leadership of a Flemish farmer, Nicholas Zannekin, and refused to pay. Under Zannekin, a coalition of farmers and peasants captured several towns, including Ypres and Kortrijk, in which they found and captured the Count of Flanders himself. At this point, Charles IV had to intervene; in February 1326, the Count was released and the Peace of Arques was agreed upon. That, however, was not to last. Revolts resumed. Charles asked Pope John XXII to place Flanders (except for the aristocracy) under Interdict, denying sacraments to the rebels. The clergy of Flanders were divided: do they follow the dictates of their pope? Is it fair to do so, since some felt the pope in Avignon had become a puppet of the king? Or do they not enforce the Interdict because, if they did, the peasants might turn on them and imprison or kill them? In 1328, realizing how precarious his position was, the Count fled from Flanders to France, where he appealed to the new king, Philip VI (Charles having died on 1 February), for military aid. Of course, Philip's claim to the throne had been disputed by King Edward III of England (for reasons too complicated to discuss here). 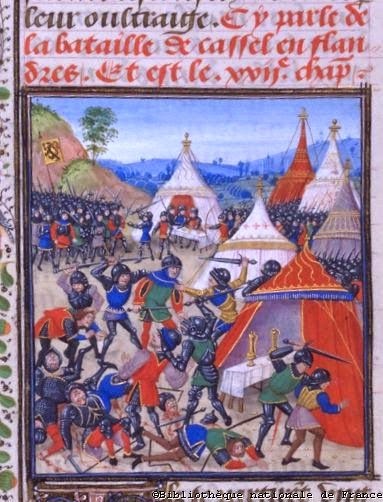 Edward having been rejected by the French aristocracy in favor of Philip, it was feared that he would ally himself with the Flemish rebels. When Edward was betrothed to Philippa of Hainault, whose father was an ally of King Charles, the fear of an English-Flemish alliance was put to rest. In fact, Philippa's father, Count William I of Hainault, was on of the leaders of the French army that was sent to quell the Flemish rebels once and for all. The French army, with military support from several dukes, Austria, and the King of Navarre, brought 12,000 troops and 2500 mounted knights to Cassel where Zannekin and 15,000 men had taken over. On 23 August 1328, Zannekin himself was killed in the Battle of Cassel and the uprising was finished for good. Eustace Busket was born about 1170 near Boulogne on the northwestern coast of France, in a high-ranking family. A younger son with few prospects of inheriting, he went to Toledo in Spain where he studied magical least, that was his reputation, and it served him well in his later career. After Spain he went home and became a Benedictine monk. By 1202, he had become seneschal and bailiff for Count Renaud de Dammartin of Boulogne. In 1204, accused of improper conduct, Eustace fled Boulogne and became an outlaw. He turned to piracy, and terrorized the English Channel for his won gain and sometimes in the employ of others. He was hired by King John of England to command 30 ships in order to harass Philip II of France. John had to outlaw Eustace when Eustace started raiding English villages, but soon pardoned him because he needed his help. His biography* tells us that Count Renaud allied himself with John against Philip and poisoned John's mind against Eustace, who then offered his service to Philip in 1212. John was having plenty of trouble in his own country, and when the barons rose up against John, Eustace supported them, even bringing Philip across the Channel to join them in their revolt. Eustace took part in many sea battles, his final one being the Battle of Sandwich on 24 August 1217, when the ships of Philip d'Aubigny's English fleet surrounded and captured him. He tried to buy his way out of danger, but they were having none of it. 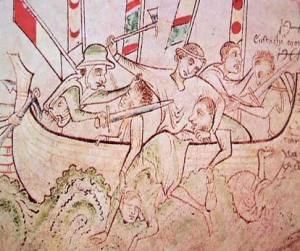 Matthew Paris tells of his beheading at sea (pictured above). *You can check it out here. There are several saints named Genesius in early Christian history: Genesius of Alvernia, Genesius of Béziers, Genesius of Rome, Genesius of Cordoba, Genesius Sciarensis (also known as Ginés de la Jara). They are likely to be made-up names, springing from misunderstandings and the desire to have a local version of the original Genesius, a very early and popular martyr. Genesius, native of Arles, at first a soldier became known for his proficiency in writing, and was made secretary to the magistrate of Arles. While performing the duties of his office the decree of persecution against the Christians was read in his presence. Outraged in his ideas of justice, the young catechumen cast his tablets at the feet of the magistrate and fled. He was captured and executed, and thus received baptism in his own blood. He is believed to have been beheaded (the quickest and surest way to execute someone). This would have happened in 303 CE, in Arles in southern France. He is often referred to as Genesius of Arles (which distinguishes him from all the "copycat" saints). Later, a church was built for him in Rome, after which he became also known as Genesius of Rome, on the assumption that he was a Roman martyr. How did he come to be the patron saint of comedians (and actors and entertainers in general)? Through fiction. A 6th-century legend of Genesius Sciarensis (who likely had no independent existence and is merely a literary duplication of the original Genesius) tells that Genesius was a comedian who, in the middle of performing an anti-Christian satire, became moved by the material and converted to Christianity; he was beheaded for this conversion. Ginés de la Jara (mentioned above) is the Spanish version of Genesius; scholars analyzing the origins of his cult recognize the likelihood that he is synonymous with the earlier Genesius, partially because the two saints have the same feast day, 25 August. A Fraternity of St. Genesius works toward the "renewal of culture" and its importance in the modern world. 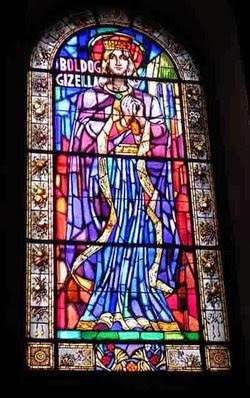 Gisela (985 - 1065) was mentioned as the wife of King (later Saint) Stephen I, founder of Hungary. She was an important person in the christianization of Hungary and, as the daughter of Duke Henry II of Bavaria, she was a link to Western Europe, becoming a part of which was one of Stephen's political goals. When Stephen died in 1038, Gisela was forced to leave Hungary in the civil strife that followed. She became the abbess of a convent in Passau, in southern Bavaria in Germany. She lived there until her death in 1065. She was buried in St. Michael's in Veszprém, Hungary, and venerated as a saint. An attempt at canonization failed in the 1700s, but she was labeled Beatus, Blessed Gisela. In Latin he was called Gerardus Magnus, but when he was born (in October 1340) in the Dutch city of Deventer, he was called Geert Groote. He was sent away to study, first at Aachen, then at the University of Paris where he studied theology, nominalism, canon law, medicine, astronomy, and even a little magic. In 1362 he became a teacher in Deventer, where his success and reputation encouraged him to adopt a lavish lifestyle, until a fellow student, Henry de Calcar, made him see the inappropriateness of this. Groote started to change in the early 1370s, inclining toward mysticism and a more humble life. In fact, he gave his worldly goods to the monastic Carthusians and started preaching a life of repentance. He gathered a small band of followers who called themselves Broeders des gemeenen levens [Dutch: "Brethren of the Common Life"]. The Brethren did not take vows, but merely gave up their possessions to live in a community where they devoted their waking hours to mass, religious reading and preaching, and manual labor. Meals were eaten as a group, with Scripture read aloud. It had all the hallmarks of a monastic life without the need to be clergy. They founded schools; Nicholas of Cusa attended one. Before he died (20 August 1384), he organized some of the Brethren who wanted a more "regular" life into Augustinians; he died before this plan was complete, but his disciple Florens Radewyns established a monastery at Windesheim that became the center of up to 100 monastic houses called the Windesheim Congregation. Groote promoted a style of piety now referred to as Devotio Moderna ["Modern Devotion"]. It was a search for inner peace based on self-deprivation and silent meditation on Christ's Passion. One of the students in his school, Thomas à Kempis, was inspired to write The Imitation of Christ, a work that (I believe) has never been out of circulation since the 15th century. Today's date is important in the history of medieval Hungary for two separate events decades apart. First, it is the anniversary of the founding of Hungary as a kingdom in 1000 CE. Originally it was just a principality in the Carpathian Basin of Central Europe, established just prior to 900 CE. The Hungarians were semi-nomadic, pushing westward in their search for more territory. The westward push was halted by Holy Roman Emperor Otto I at the Battle of Lechfeld* on 10 August 955. This convinced the Hungarians to settle down where they were. There was internal strife in Hungary, however. When the ruling probe of Hungary, Géza, died, his brother Prince Koppány claimed the right to rule. This claim was challenged by Géza's son, Vajk, who had been baptized a Christian and taken the name István (Stephen). Stephen wanted to turn Hungary into a European Christian kingdom. Koppány wanted to adhere to the traditional tribal ways. Forces loyal to each clashed in 998 where Stephen, whose Christian connection brought him the support of Bavaria, prevailed. Koppány was cut into 4 pieces and the parts sent throughout the kingdom as a sign of how troublemakers could expect to end up. On Christmas Day 1000, Stephen I was crowned King of Hungary with a crown sent to him by Pope Sylvester II, establishing Hungary as a kingdom and country in its own right. 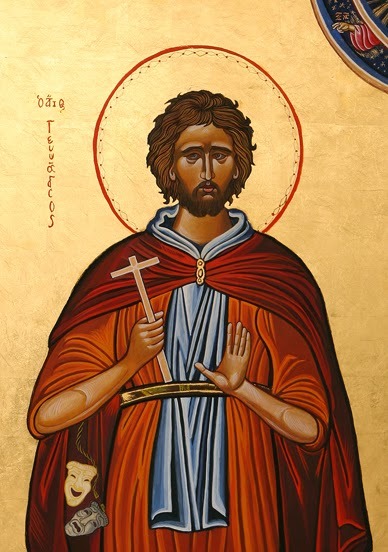 Stephen turned out to be a great friend to the Roman Catholic Church, which leads us to the second reason this date is important for Hungary. 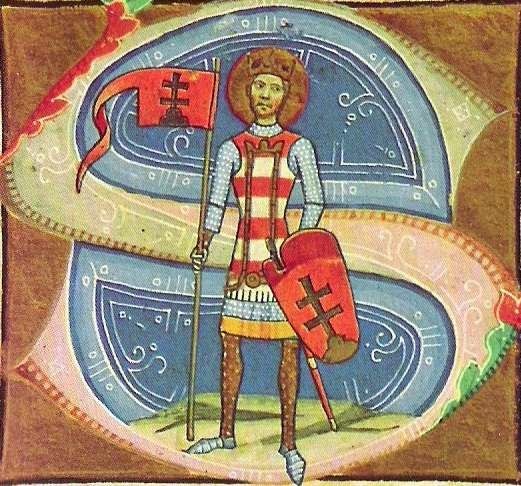 In 1083, Stephen I of Hungary was canonized as St. Stephen. He established the presence of the church in Hungary very throughly, with six bishoprics and three monasteries and penalties for not following Christianity. Hungary became a safe route for pilgrims traveling from Western Europe to the Holy Land. Sadly, no children by him and his queen, Gisela of Bavaria (also known as Gisela of Hungary), survived, and upon his death there was civil war. His reign was a time of peace and a golden age for the spread of Christianity in Central Europe. His feast day, 20 August, is also a holiday in Hungary celebrating the founding of the country. *Curiously, this was the second Battle pif Lechfeld; in the first, fought in 910, Hungarians defeated a Frankish army, but failed to establish dominance in the region. King Edward I had 16 children by Eleanor of Castile (and three by Margaret of France after that). His ninth child was Alphonso, made the Earl of Chester. Alphonso was named for his godfather and uncle on his mother's side, King Alfonso X of Castile. Despite being the third son, Alphonso was named as his father's heir because of the early death of his older brothers. 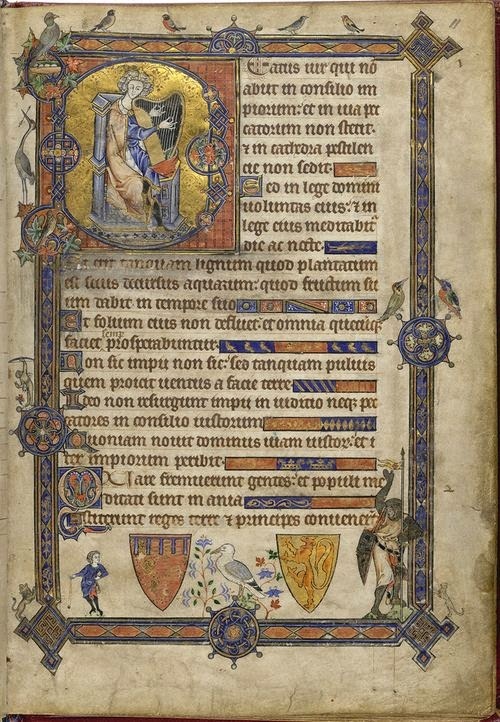 Alphonso, who was born 24 November 1273, was engaged to marry Margaret of Holland, daughter of Count Floris V. In preparation for the wedding, a beautiful psalter (an illuminated copy of the Book of Psalms) was being prepared as a wedding gift. Unfortunately, Alphonso died on 19 August 1284,* and the psalter was left unfinished, only to be completed 10 years later for the wedding of his sister Elizabeth to Margaret's brother, Count John I of Holland. The Alphonso Psalter is 9.5 inches tall and 6.5 inches wide, and it sits in the British Library today (designated 24686). It is considered the first major work of the "East Anglian style" of gothic illumination. The East Anglian style is what we often picture today when we think of illuminated gothic manuscripts: filled with border illustrations that are entertaining and distracting rather than directly enhancing the text. Besides the psalms, it includes obituary information for many members of King Edward's family, the Athanasian Creed, and the litany of the saints (a prayer that invokes all the saints). *730 years ago today. Alphonso's younger brother, Edward, was the only surviving son of Edward, and became Edward II. Say you are a king who has conquered a wide territory. Most of it is uncultivated, unused, and therefore is not generating income for anyone from whom you can demand taxes. It is wilderness, home to wild animals and lawless men. How do you turn this to an advantage? That was the situation faced by King Edward I in southwest France when he controlled Gascony: hundreds and hundreds of square miles with no one in sight. His solution was bastides. A bastide was, quite simply, a village. Villages don't just spring up from nowhere. Over time they spontaneously develop at sites where it was advantageous to be: where two roads crossed, or at a ford in a river, or a natural harbor on the coast, etc. But if you wanted to fill the wilderness with villages, you had to spend money. 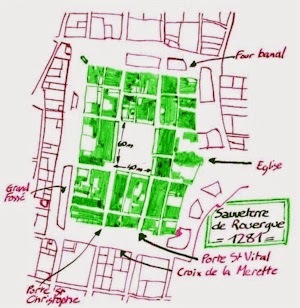 Edward created one bastide, Baa (now vanished, but named at the time for the Bishop of Bath), by buying the land from the lord of Blaye for £547 in 1286. Edward would assign one of his trusted men to oversee the building and layout of a bastide. They were generally built around a central marketplace, constructed with sturdy and attractive arcades. The town surrounding the market was laid out to form a square. Defenses were not necessarily a part of the initial architecture, although Edward II and Edward III added defenses to some later. The creation of bastides had several benefits. Not only did settlers create the opportunity for rents and taxes, but also the town was a local administrative centers where laws could be disseminated and enforced. Not all bastides were initially welcome, however: one called Sauveterre de Guyenne was delayed because other towns nearby feared the loss of revenue caused by a new town generating its own market supply and demand. Walafrid Strabo (c.808 - 849) was born in Swabia to a poor family. He studied under Hrabanus Maurus, and became a monk. He entered the court of Louis the Pious as teacher to his son Prince Charles (the Bald). When the sons of Louis warred with each other, however, Walafird sided with Lothair (the losing side). He had to flee to Speyer, but was later reconciled with the winning side, Louis the German. Then, you may rest assured, your soil will not fail you. He also described the layout of the garden. He also revised Einhard's Life of Charlemagne in such a way that it is considered one of the outstanding biographies of the Middle Ages. As for his theological works, one of the most famous (and useful) has the unwieldy title of Liber de exordiis et incrementis quarundam in observationibus ecclesiasticis rerum ["Book on the Origins and Development of Certain Matters in Church Practice"]. In 32 chapters, he deals with several sacraments and the accoutrements of church services, and church buildings. Along the way, he uses some of the less formal German terms for ecclesiastical subjects. He apologizes for his use of two sets of terms by comparing it to King Solomon's practice of keeping not only peacocks at his court, but also monkeys. Walafrid died on 18 August. have never been so blatantly exposed to the public eye. In 1183, when Henry II of England's son, Henry the Young King, died (and the events of a great movie took place), Saladin conquered Syria, and halfway around the world, a sword and a mirror and a jewel were being lost. 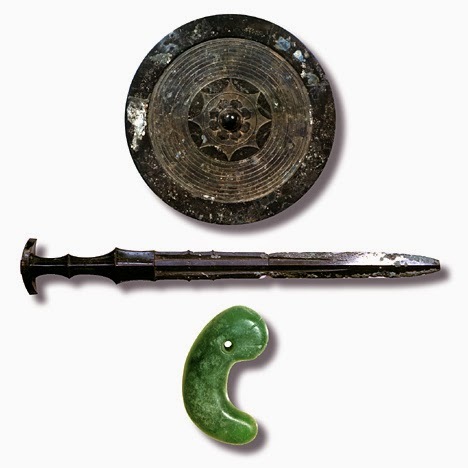 Loss happened all the time, whether in Europe or Asia, but these items were the Three Sacred Treasures of Japan. The Three had been used since at least 690 CE for investing the Japanese emperor with the symbols of his authority. They came to represent three virtues: valor (the sword), wisdom (the mirror), and benevolence (the jewel). They continue to be treated that way, although they are not part of a public ceremony: the emperor is invested with these privately, and no definitive pictures exist of the items. The jewel and sword were used in 1989 and 1993 in the ceremony for Emperor Akihito, but they were wrapped and not seen. Emperor Antoku was only eight years old. His grandmother, as his guardian, tried to prevent capture by throwing herself, and the emperor, and the sword and jewel into the sea. Divers found the jewel, but not the sword. The mirror was captured, but the story goes that a soldier who opened its box was struck blind. With the loss of the sword, how would any emperor be properly invested? That's when the stories start: that a replica was made, or that the original is in the hands of the authorities, and it was a replica that was thrown into the sea. Perhaps this is why the regalia were shrouded when used for Akihito's ceremony. Whether what exists is truly the original set is immaterial to historians. During the 14th century, Japan was divided into a Northern and a Southern Dynasty, with each dynasty claiming an emperor. Since the Southern Dynasty possessed what was claimed to be the Three Sacred Treasures, historians award them the legitimacy of government, and count those emperors as the "real" emperors. On 13 August 1099, a Cluniac monk from northwest of Rome named Ranierius was named Pope Paschal II, following Pope Urban II. He sat the chair of Peter until 21 January 1118—a long stretch compared to many popes. Like other popes, he had to deal with the controversy over investiture; in his case, specifically, he weighed in on England's trouble between King Henry I and Archbishop Anselm of Canterbury, finding the same solution later settled in the Concordat of Worms: agree that the pope names clergy and confers religious titles, but the king of England can confer secular titles and grant land. Paschal also had the opportunity during his reign to unite the Catholic (Western) and Orthodox (Eastern) churches; Emperor Alexios I was willing. Paschal, however, laid down the condition that the pope be seen as the ultimate ruler of all churches throughout the world, and this the Patriarch of Constantinople would not agree to. *Vatican and Icelandic records both mention this; see These Stones Bear Witness, by Richard White for more on the Norse presence in North America. There was a recent mention that Holy Roman Emperor Henry IV was best known for the Investiture Controversy. Investiture was the act of conferring on someone honors or titles. In this case, the controversy was over who had authority to name clergy, the king of the country in which the bishop would preside, or the pope? Obviously, kings would like to choose the people who would manage ecclesiastical courts, and stock the positions with those loyal to the throne. The pope (and other clergy) would much rather have the Church decide on these positions and not owe any particular loyalty to secular governments. The concern of the secular authority was based on the fact that a bishopric carried with it a grant of land, and the secular lords wanted to make sure those lands were still under some kind of control. A bishop named by the pope would not necessarily be loyal to the local lord. 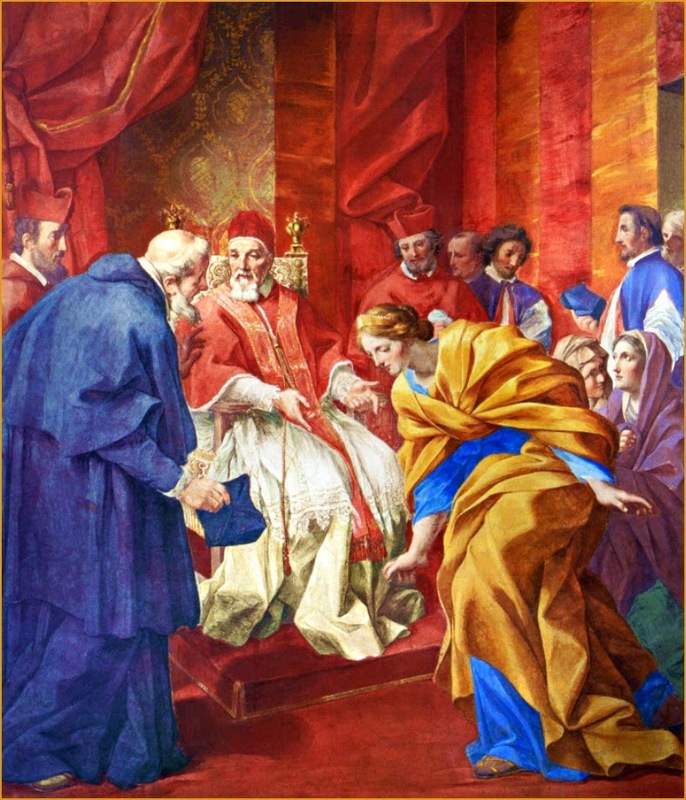 Pope Gregory tried to reform some church practices, including bringing the power of investiture completely under the papacy. For a long time, Germany was in the position of ratifying popes, but when Henry IV first became king of the Germans in 1056, he was only six years old, and so the Gregorian reformers acted fast to wrest the power of the papacy away from German control. The Church created the College of Cardinals as the body authorized to elect a new pope. In 1075, Gregory declared that the sole universal power in the world was the pope's; secular power only applied to local concerns. He also declared that the pope alone had power to appoint or depose clergy, and the pope had power to depose an emperor. Henry opposed this, and continued to appoint clergy, but the pope excommunicated him. If his nobles had stayed loyal, the outcome might have been different, but much of the aristocracy turned on him, forcing him to make the Walk to Canossa. Even the resolution at Canossa did not stop the battle between popes and emperors. In 1122, a "final" resolution was made with an agreement between Henry V and Pope Calixtus II. Called "The Concordat of Worms" (because the meeting took place near Worms), it gave the German kings the power to grant or withhold secular power (lands, titles) to clergy, but not to make them clergy. This controversy did not exactly begin (or end) with Henry IV and Pope Gregory VII. The debate between papal and secular authority to confer titles was confused on Christmas Day 800 when Pope Leo III placed the crown of the Holy Roman Emperors on his head during Mass. This raised the question whether the pope had the authority to pick an emperor or king. And the Concordat did not exactly resolve the issue everywhere: just between Germany and the pope. England and the papacy also butted heads over this, which we will look at tomorrow. Among the western Europeans who traveled eastward and wrote of the wonders of "The Orient," we have mentioned William Rubruck (c.1210 - 1270), who traveled to Karakorum, the capital of the Khans. The Khan at the time was Möngke Khan. 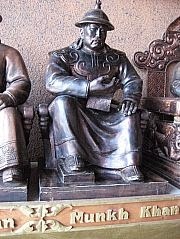 Möngke was a grandson of Genghis Khan. He ruled the Mongol Empire from 1251 to 1259, and was succeeded by another of Genghis' grandsons, Kublai Khan. During his reign, Möngke continued to conquer more territory and bring it under Mongol control. He was also a politician who cared about proper governance of the empire. One of the things that needed correction was the Mongol monetary system. Paper money (first authorized by Genghis shortly before his death in 1227) was being printed and issued without control since the reign of Ögedei Khan. (Ögedei was himself childless, and Möngke and Kublai had been raised at his court.) Möngke created a Department of Monetary Affairs in 1253 to control the printing of paper money and create currency standards. An empire-wide silver standard was established—the sukhe, a silver ingot that could be divided into 500 sub-denominations—although conquered territories could continue to mint their own traditional denominations. Eventually, coins of other metals were introduced. Möngke died on 11 August 1259, while conducting a war in China. His death led to a four-year civil war between two younger brothers, at the end of which Kublai defeated Ariq. The news is full of the tragedy of the Yazidi, trapped on a mountain to which they fled from the group ISIS. In an area of the world where religious differences make enemies, the Yazidi find themselves isolated from almost everyone else because of their unique blend of different religions. The origin of the name of "Yezeedee," by which they are more commonly known, is referred by some among them to Yezeed ibn Moawiyah, but this is only a stratagem to secure their toleration by the Mohammedans. For a like purpose [...]. The quotation from the Koran near the tomb was also admitted by several Kawwâls to have been introduced as a blind, and in order to prevent the Moslems from desecrating; their sacred shrine. It appears that they have tried to fly "under the radar" of Muslims for a long time. Another origin is that they were founded by Yezid ibn Unaisa, a member of a subject of Islam. Or they were started by a Sufi leader known as Sheik Adi bin Musafir who died in 1162. The Yazidi believe in one god who created the world and left it to the care of seven angels. The most important of these is the angel Melek Taus, the "Peacock Angel." Sheik Adi was supposed to be a representative of Melek Taus on earth. Melek Taus was created before the other angels, and told by God never to bow to anyone else. Melek Taus, however, upon encountering Man, recognized his greatness and bowed to him. 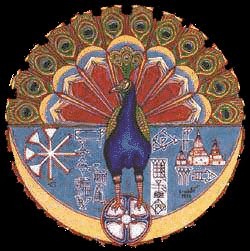 As the "best and brightest" of the angels who went against God's decree, Melek Taus has been equated by Muslims with Satan/Lucifer, and for that reason alone the Yazidi would find themselves a target for Muslim persecution. Yazidi beliefs show similarities to Christianity, Judaism, Zoroastrianism, Islam and Gnosticism. They believe they are descended from Adam, but not from Eve; rather, through Adam's son Shehid bin Jer. ** They do not believe in Original Sin, but that humans possess both good and evil, and have the opportunity to choose; just as Melek Taus chose good by bowing to Man. They have restrictions and taboos that govern castes (marrying outside your caste is a capital offense), food, and the need to live in a Yazidi community rather than with outsiders. They also believe that souls can reincarnate when needed, using the metaphor of changing a dirty garment for a clean one. Moreover, they believe that the seven angels are capable of incarnating in human form when needed (just as they believe Sheik Adi was Melek Taus). They pray five times a day. As of this writing (8 August 2014), the majority of Yazidi have fled Muslim persecution by trying to take a mountain route on foot to reach Dohuk in Iraqi Kurdistan. Humanitarian aid has been announced, as well as airstrikes against the pursuing ISIS army. **A neat trick, whose explanation can be found in paragraph six on this site. 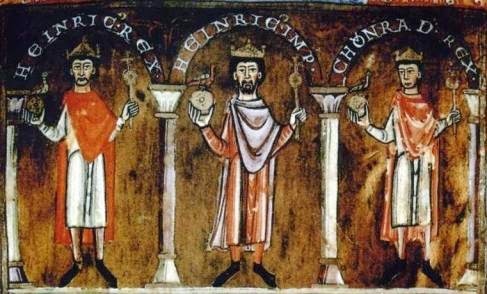 Holy Roman Emperor Henry IV is best known for the Investiture Controversy and the Walk to Canossa, when he did penance so that Pope Gregory VII would lift an excommunication. Henry was excommunicated again in 1084; however, this time he wasn't so penitent. He marched into Rome, deposed Gregory, and appointed his own pope, Clement III. The College of Cardinals had another idea, however, declared Clement III an "anti-pope," and appointed their own pope, Pope Urban II. Urban supported Gregory VII's ideas and opposed Henry, as did Pope Paschal II who followed him in 1099. Henry was prepared to oppose the popes, but a further betrayal created worse trouble for him. His son, Henry (1086 - 1125; later Holy Roman Emperor Henry V). Sons in line for the throne often make designs on that throne before their predecessor departs by his own choice, and young Henry decided that his father's excommunication was good grounds for staging a rebellion. In 1104, young Henry decided it was time to stand up and depose Henry IV. The Church was willing (naturally) to support the son against the father who had proven to be no friend to the papacy. Henry IV had been trying to maintain order in the Empire, and did not want a war. He agreed to a meeting to try to achieve a peaceful resolution; the meeting, however, was a ruse, and he was captured by his son's forces. 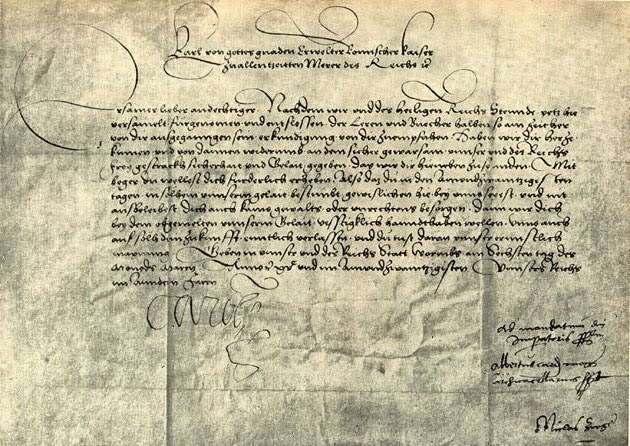 Imprisoned in Böckelheim Castle in southwestern Germany, he was forced to renounce his creation of Pope Clement and to admit that he was unjustly hostile to Pope Gregory. Henry IV was German, however, and Germany itself was not keen on having their king deposed and imprisoned by a teenager who then declared himself Holy Roman Emperor Henry V. In 1106, forces loyal to Henry IV opposed his son and the pope and freed Henry IV from his prison. Henry Senior started making alliances with other nations for support. Early in 1106, he defeated his son's forces, but he succumbed to an illness of several days and died on 7 August. Because he was still excommunicated, his body was placed by order of the papal legate into an unconsecrated chapel until the excommunication was lifted in summer of 1111. The Dominicans have been mentioned many times, and their founder has been mentioned as a friend of Simon de Montfort, but his life deserves a little more attention. In 1191, when Spain was suffering from famine, the young university student Dominic sold all he owned—including his clothes—for money to feed the starving poor. A few years later he joined the Canons Regular, who followed the rule of St. Augustine. 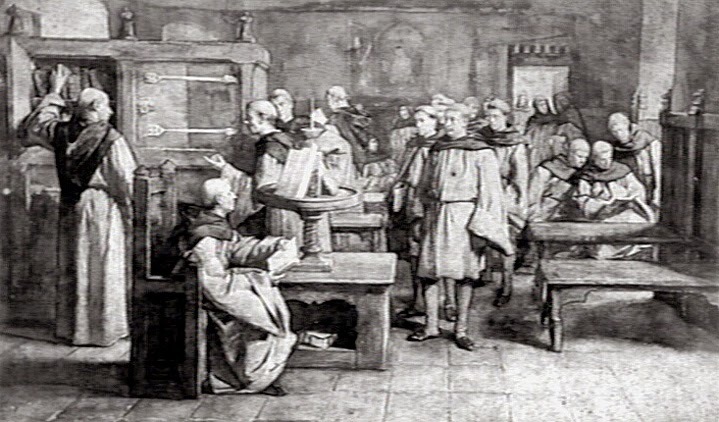 In 1215, the year of the Fourth Lateran Council (mentioned here and other places), Dominic and six disciples started their own house in Toulouse with some monastic rules, and were given permission by the local bishop to preach in Toulouse. That same year, Dominic and the bishop went to Rome to request permission for the founding of a new order to combat heresy; it was given by Pope Honorius III in the winter of 1216/17 and called Ordo Prædicatorum ["Order of Preachers"] (which is why, although referred to as "Dominicans," they have the initials "OP" after their names). 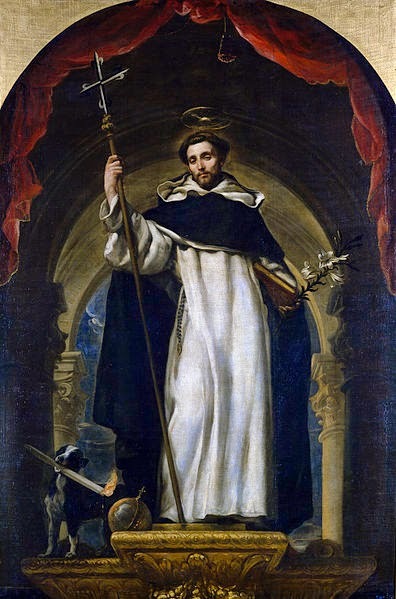 Interest in his order grew, and although his headquarters was in Rome where the pope had given the Dominicans a house, Dominic constantly traveled to keep in touch with the various chapters. We are told that he abstained from meat and excessive food and talking, and that he never allowed himself to sleep in a bed. The use of the rosary is attributed to him: it was known earlier, but he certainly promoted it as a guide for prayer. His icons, seen in the picture above, are the lily for his chastity, the book and staff representing his authority to preach (supposedly granted to him by a vision of Saints Peter and Paul), and the star above his head. The star was seen by his mother in a vision before he was born; because of it, he is considered the patron saint of astronomers. The last symbol, also seen by his mother in a vision, is the dog with the torch in its mouth, representing that he was to "set fire to the earth" with his preaching. This ties directly to the Dominican connection to the Inquisition, which will get its own post in the near future. Dominic died on 6 August 1221. *St. Dominic of Silos (1000 - 1073), who had been abbot of a monastery a few miles from Dominic's birthplace. **The name eventually given to Dominic's mother was Joan of Aza, and that name was beatified in 1828 by Pope Leo XII. The city of Bari is located in southern Italy, right at the "Achilles Heel" so to speak. This blog has mentioned it as the final resting place in 1087 of most of the bones of St. Nicholas, but we haven't talked about the details of how they got there. The relics were originally held in the city of Myra in Lycia (Nicholas was the Bishop of Myra; Myra was in what is now Turkey), but their existence was threatened by the expansion westward by the Turks. Merchants from Bari decided the relics weren't safe, so they sailed to Myra to take matters (and the relics) into their own hands. The Bari merchants hired Venetians to take them to Myra. Two men left the ship to visit the Church of St. Nicholas to see how well the relics were guarded. They found only four monks tending the relics, so they returned to the ship and brought over 40 armed men to the Church. Suspecting nothing amiss, the monks and guards showed the merchants and their men the platform under which the relics rested, and where pilgrims were anointed with the "Oil of Saints" from the relics. The Barians offered 300 gold coins in exchange for the relics, but were refused. They bound the monks and guards, and proceeded to take apart the platform to get at the relics. The relics were wrapped in cloth and carried to the ship. The monks, however, having been set free when the deed was done, alerted the town; the townspeople flocked to the shore, but the ship was already sailing. This was on 20 April. The ship arrived in Bari on 8 May 1087. Carrying the relics to the church of St. Stephen the next day* caused many miraculous healings along the way. The following year, Bari built a church dedicated to St. Nicholas, where the relics have remained ever since. *9 May became a special feast day for St. Nicholas in the Russian Orthodox Church. The Lincoln title belonged to her mother, Margaret de Quincy, not her father. 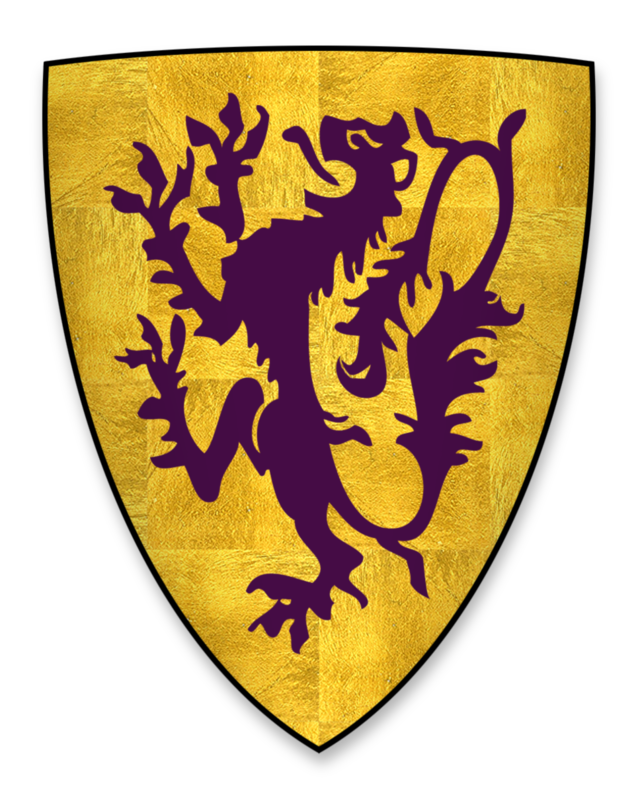 Maud might have someday inherited the title, but her mother named a different heir: Henry de Lacy, Maud's nephew by her deceased brother. Maud's feelings about her mother were not improved when her mother remarried in 1242 to Walter Marshal, the 5th Earl of Pembroke, inheriting the majority of his property after Walter died in 1245. We are told by one historian that the two women argued about finances regarding the wealth that Margaret held in the Marshal property. Maud married Richard de Clare, 6th Earl of Gloucester, in 1238 when she was 15 and he was not much older (Richard was born 4 August 1222). Richard had actually been married once already! He had been married to Margaret, the daughter of Hugh de Burgh. Hubert got in some trouble for this, since the marriage did not have the approval of King Henry III, and Richard was Henry's ward! Hubert gave the king money to let the matter slide (Henry, like his father John, always needed money). That wasn't the only money involved in Richard's wedding(s), however. Maud's father would have liked his eldest daughter joined to the powerful and wealthy de Clare family. Sensing problems in the marriage between Richard and Margaret de Burgh, the Earl of Lincoln offered King Henry 5000 marks (about £3300) to approve a marriage between Richard and Maud. Margaret died (very conveniently) in late 1237, leaving Richard free to marry Maud, which he did on 2 February 1238. 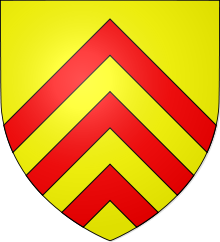 Among there children was Gilbert de Clare, who would join Simon de Montfort in rebelling against Henry II, but later recant and support the throne and Henry's son Prince Edward. *Not all barons signed the Magna Carta. The "Surety Barons" were 25 who were elected to sign the document and whose job was to see that it was adhered to. Marco Polo was not the only, or the first, western European to travel to the East. 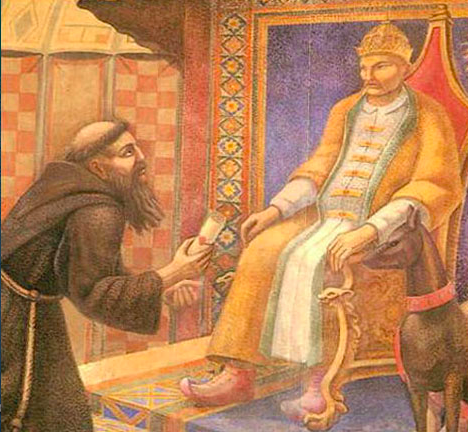 When Pope Innocent IV wanted to send a letter to the Great Khan of the Mongols, who was persecuting Christians, he sent it with Giovanni da Pian del Carpine (sometimes called Friar John of Plano Carpini). Giovanni was born about 1182 in Umbria, Italy. He was a companion of St. Francis of Assissi, and therefore one of the first Franciscans. He was instrumental in the Franciscan missions to Northern Europe. Pope Innocent chose Giovanni to carry a letter to Ögedei Khan, after Mongol forces made serious inroads into Europe at the Battle of Legnica in 1241. The aforesaid men ... obey their lords more than anyone else in the world, whether clergymen or laymen, and they respect them greatly and do not easily lie to them. The Tartars seldom argue to the point of insult, and there are no wars, quarrels, injuries or murders among them. In fact, there are no robbers and thieves of valuables there, so that the camps and carts where they keep their treasures are not protected by locks or bars. Their women are chaste, and one never hears scandals about them, though they tell coarse and vulgar jokes. For his efforts on behalf of the pope and Christendom, Giovanni was made Primate of Serbia. He died on 1 August 1252, two years before Marco Polo was even born.